It seems like Charles Oliveira has been around forever as he makes his 23rd UFC appearance, but he is only 29-years-old and takes on David Teymur, also 29, but with only nine MMA fights under his belt. However, Teymur also has vast fighting experience as a successful kickboxer and Muay Thai fighter and he has transferred his skills over effortlessly. After losing his first fight, he has won eight on the bounce with impressive wins over top fighters including Lando Vannata, Drakkar Klose and Nik Lentz. Oliveira is a phenomenal striker but Teymur will relish the stand-up battle and even back himself to find a knockout. However, the Brazilian has too much experience to make that mistake and will manipulate the fight into his strengths. 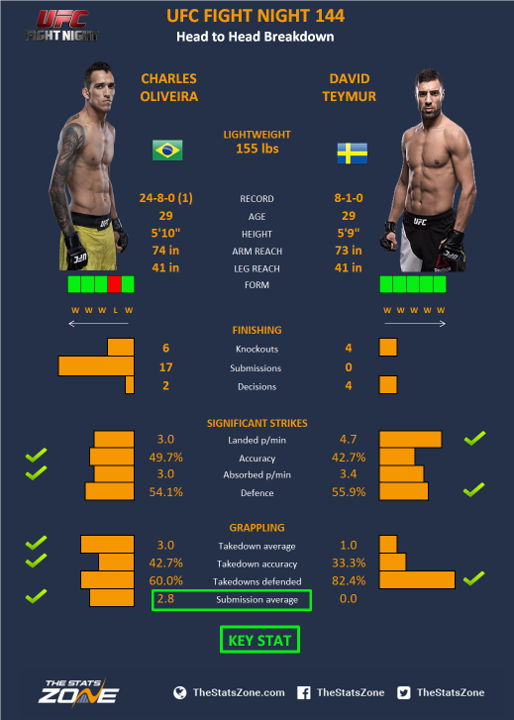 This is not a good match-up for Teymur, who with unproven ground skills takes on the fighter with the most UFC submissions of all time. Oliveira is expected to stretch that record and hand the Swede his first UFC loss.